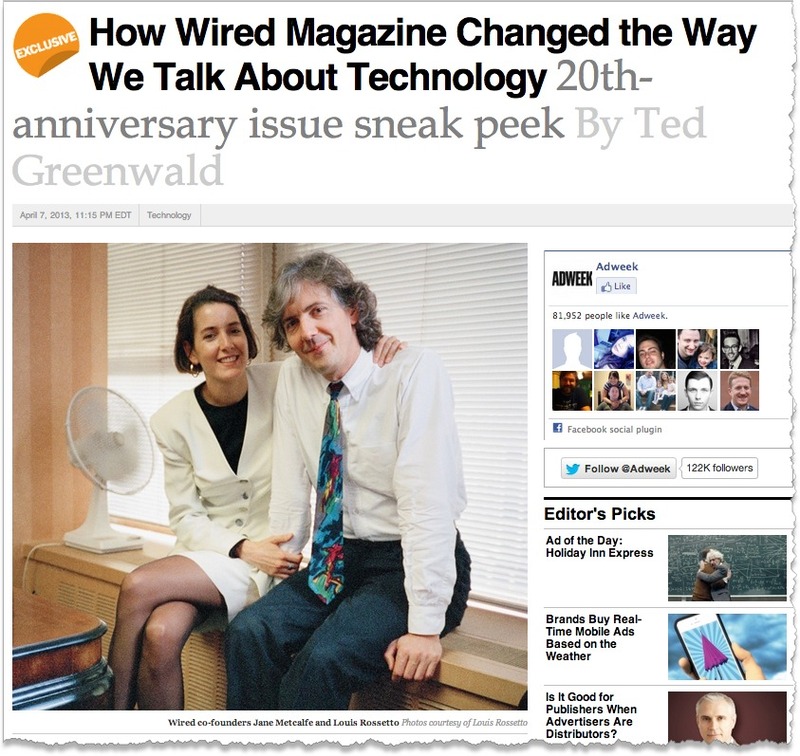 Adweek has a great article by Ted Greenwald on how Wired Magazine got its start. It has lots of interviews with the founders, including my good friend Fred Davis, a veteran senior publisher and editor at Ziff-Davis. In 1988, Louis Rossetto, an adventurer, onetime novelist and avid libertarian, sensed that the encoding of information in 1s and 0s was going to change everything. Over the following year, Rossetto and Metcalfe hammered out a business plan for a new magazine, tentatively called Millennium, that would take this revolution to the US mainstream. Technology, Rossetto predicted, would be the rock 'n' roll of the 1990s, and the pair aimed to make Millennium its standard-bearer. The proto-prototype's cover featured a dour-looking John Perry Barlow, who had recently co-founded the Electronic Frontier Foundation, in a photo cadged from the New York Times Magazine. Fred Davis (contributing editor, fetish section): I had been working for Ziff-Davis as an editor at PC Magazine, PC Week, A+, MacUser. Louis and Jane showed up at my house in Berkeley, literally broke. They had a good concept, but to raise money, they needed a good story about the audience. I helped them put that together. Eugene Mosier (art director for production): I had just left a job at MacWeek and I was trying to decide what to do. Fred Davis said, "Come to a party at my house, you'll meet some interesting people." [Louis] Rossetto: Kevin [Kelly], John Battelle, and I drove the editorial direction pretty much exclusively. We had a couple of wonderful strengths: We had a clear vision of the kinds of stories we wanted to read, and we had utterly complementary interests. John liked business, Kevin liked going out over the edge of the future and coming back with fresh kill, and I liked to figure out the big picture of what was going on now. Foremski's Take: I remember the first issue of Wired, it was interesting and virtually unreadable. The design was so avant-garde that the text was used as a design element and was lost in swirling colors. The magazine at first, seemed to be copying the style of another magazine that was around at the time, Mondo 2000, a seminal local publication that had a great following, but an irregular publishing schedule. Wired sorted out its text problem and it became a great magazine to read. However, it started flag badly after Conde Naste acquired it in 1998. It seemed to be in a death spiral creatively, and financially. 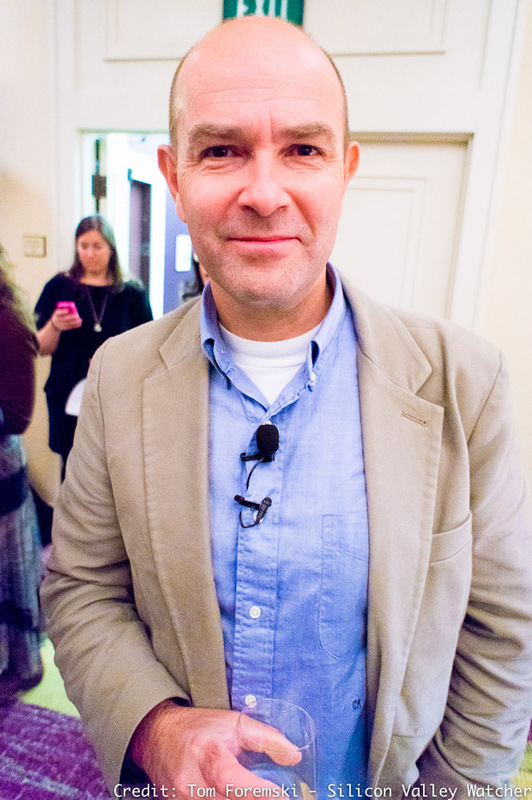 Conde Nast managed to reboot it primarily because it hired Chris Anderson (below), who recently left after 12-years as Editor-in-Chief of Wired Magazine. He took over in 2001 when Wired had become very "Tired," to use one of its catch-phrases at the time. Mr Anderson made a big difference in re-energizing the magazine with great articles, and he rebuilt the brand -- which is astonishingly difficult when a media title is on a downward slope. He and his colleagues, took Wired from tired -- to inspired. It's doubtful that there would be a 20th anniversary of Wired magazine without the efforts of Mr. Anderson, and the editorial team of the past decade.